The generalised vertical section (.GVS) and geological legend (.GLEG) files were assembled in a combination of Notepad, Wordpad and Excel and iterated as the model expanded and new units were encountered. A regional catch all approach was adopted from the very start. The GVS (see Appendix 2) was created by S Thorpe using DiGMapGB-50 data. The GLEG files (see Appendix 3) were also created by Steve Thorpe by clipping data from the BGS corporate DiGMapGB-10 and DiGMapGB-50 datasets along the route of the HS2 corridor, as defined by a 5 km buffer. Generic GVS and GLEG files were created for the whole HS2 route, rather than for each individual model area. Thus the units used in this model are only a subset of those available in the HS2 GLEG file. 20 m DTM obtained from the BaldEarth model and trimmed to the project area (5 km buffer of the route shapefile) by Steve Thorpe. Two separate borehole coding sessions were completed by Jo Thompson (JBRAYSON) and later by Keith Ambrose (KAM). The boreholes were extracted from SOBI database by Steve Thorpe (ST) using a set of queries, following the later session an update was provided on 27th March 2014). The BLG file needed to be deduplicated and the Borehole Filter Tool was used to address this. The following priorities were applied to borehole records that were coded by more than one project. The records at the top of this list have a higher priority and the filter tool keeps these records and discards other matching records. This left a total of 162 boreholes coded out of a total borehole count of 634. Bedrock and Superficial geological 50k Digmap shapefiles loaded. 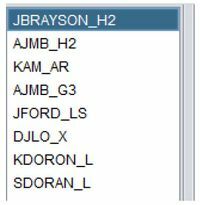 ST handed over to JBRAYSON 20th Dec 2013 for review and subsequent changes in base data will be recorded in this section. KAM took over this project in Mar 2014. JBRAYSON took back the project in April 2014. All cross sections from Areas 3 and 5 were loaded in to the model in order to edge match, these were then trimmed by S Thorpe and used to help calculate the model. The isopachytes from Figure 15 of the Chipping Norton Memoir (Horton et al., 1987) were used to inform the model (Base Lower Lias). ↑ Horton, A, Poole, E G, Williams, B J, Illing, V C, and Hobson, G. D. 1987. Geology of the country around Chipping Norton. Mem. Br. Geol. Surv., Sheet 218 (England and Wales).